One of the main reasons to love a July Fourth BBQ is the food (of course!). 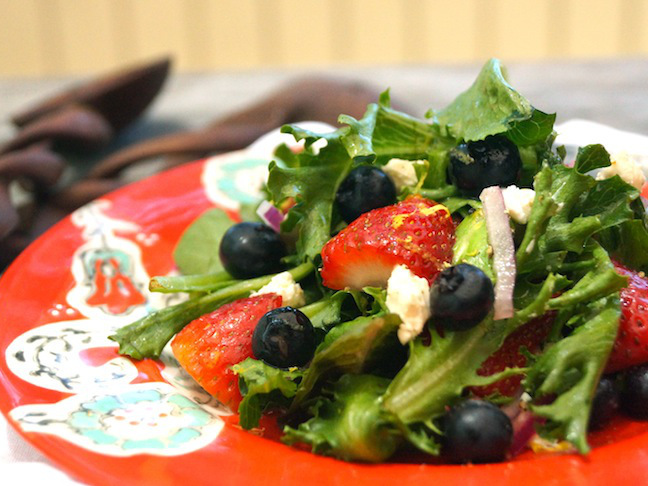 And this light, healthy, super delicious strawberry blueberry salad is the perfect accompaniment to the smoky, charred burgers coming off the grill. Kids will love the naturally sweet berries, parents will love that the kids are eating greens, and everyone will love the patriotic deliciousness! Step 1: Add the greens, strawberries, blueberries, and red onions to a large mixing or serving bowl. Toss gently, and set aside in the refrigerator, lightly covered with plastic wrap, until you're ready to serve. Step 3: Toss the salad with the lemon dressing, evenly distribute the goat cheese on top, and serve.